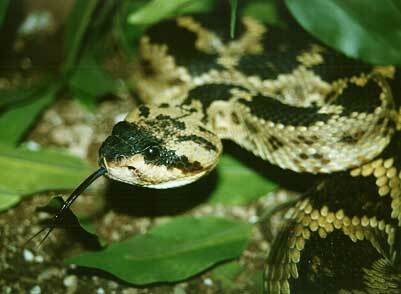 Blacktailed Rattlesnakes do not aggressively defend themselves when molested and seldom rattle. Some may gape their mouths as the Cottonmouth does when disturbed. Almost always found in rocky areas, they may occupy a variety of habitats - deciduous forests or pine woodlands, grassy hillsides, or cactus and agave groves. They often climb into low-growing bushes, possibly foraging for small nestling birds, or to bask in the sunlight. They are active both day or night, but seek shade in the heat of summer days. They may attain lengths in excess of 4 feet, but average 36 to 40 inches and are found in central Texas west through New Mexico, much of Arizona, and south to northern Mexico. Sidewinders and other young rattlesnakes often fall victim to larger and faster predators such as the desert roadrunner. Most rattlesnakes do not survive their first year.